A web-based change management, issue tracking, and software bug tracking system, a proven enterprise-grade solution for effective team communication, best user experience, easy to use, yet still flexible and reconfigurable to your unique business process and workflow. A web-based help desk customer support, trouble ticketing, general customer tracking, and email management application, uses the same code base as that of the Bugzero software. Solve your copy-protection problem with this Java license toolkit for Java™ software products, it creates and validates license keys. It is not fancy, but it works great. Hosted on-demand bug tracking. No hardware, no software installation, no upgrade, no maintenance, and no headache. It is there for you any time, and only when you need it. We invite you to join our reseller partners program. 3/14/2017: Bugzero 6.7.2 released! 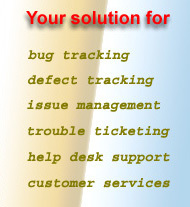 Bug tracking and help desk customer support is made easy and more flexible... >> more. • 1/27/2005: Bugzero in complete Chinese interface.